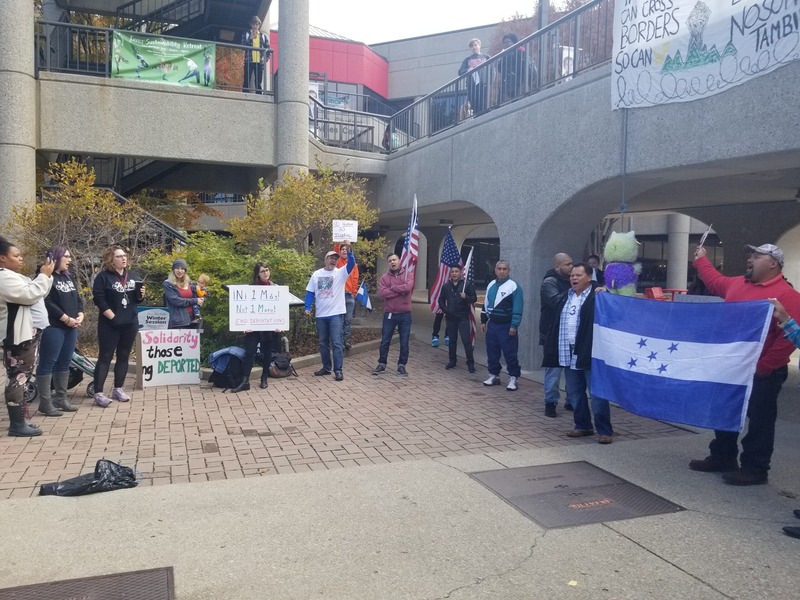 Students and community members rallied outside the Student Activities Center (SAC) Nov. 7 in solidarity with the immigrant caravan coming from South America. Organizers rallied to support asylum seekers trekking across Mexico toward the United States. Also featured behind the rally were two piñatas with the faces of President Donald Trump and now-former Attorney Jeff Sessions. The piñatas were filled with Planned Parenthood condoms, ACLU “know your rights” cards and candy. U of L junior Jennifer Bencomo said the condoms “were meant to represent, that immigration rights are reproductive rights too. People are allowed to seek asylum for their entire family too,” she said. Bencomo said the ACLU cards will inform people of their rights if they have run-ins with police or ICE agents. “Every single person regardless of their immigration status has rights, and they need to know their rights,” said Bencomo. The rally was organized by a community group known as Mijente and is a national organization. Mijente is a Pro-Latinx, Pro-Black, Pro-woman, pro-queer, and pro-poor organization according to their website. One member of the crowd told his story of life in Honduras. He said he came from Lexington to be part of the rally. While the rally was primarily aimed at the asylum seekers, it was also meant to remind others that no human is illegal. Bencomo encourages members of the U of L community to do more than be keyboard warriors. She hopes that more people will join rallies, volunteer in their community and speak out against injustices. “Ultimately we hope that people will show out and support issues that don’t directly affect them,” said Bencomo.